Fabulous and festive, the Kate Spade New York® Rhett sandals will bring your look alive. Darling bow with charms at the front. We can't currently find any similar items for the Rhett by Kate Spade New York. Sorry! Cute but they run small. Keeping a size 6 in the Leopard. Took me several tries to get the right size and pair, but worth the time and energy! I appreciate Zappos’s generous exchange policy. My feet are right in between 6 and 6 1/2, more like 6 1/4. Tried the 7 but they were too long in length. Also, for this type of sandal, I like them to fit perfectly, or they would make my feet look bulky. However, some people like extra room in the back. 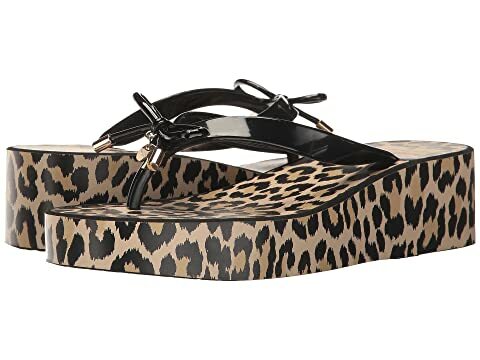 I had been “watching” the Leopard color like a stalker for a month and finally caved in.... Karen, the Zappos rep who placed my initial order was very nice, wish I could say the same for the next rep who helped me with the exchange, but hey, probably one of those bad days for everyone. Nonetheless, glad that I am finally keeping the perfect pair! These sandals are super cute, and overall very easy to wear. I'm not sure I would do anything like dancing in them, or long walks, because the straps connect under your foot in a way that feels like it might start yo hurt after an extended period, but if you just want something to wear to the store or out to lunch or coffee, they are perfect! I should also mention that the first time I wore mine to the coffee shop I had a lady running up to me and asking where she could get them. Not bad!